Marie Curie is a UK based charity that provides care for people with terminal illnesses both through their hospices and through the nurses they employ to provide care at home. In 2012/13 they provided over 1.3 million hours of nursing care and to continue with their work they need to continually raise money through charitable events and donations. 70% of their funding comes in this way with the remainder being provided by the NHS. 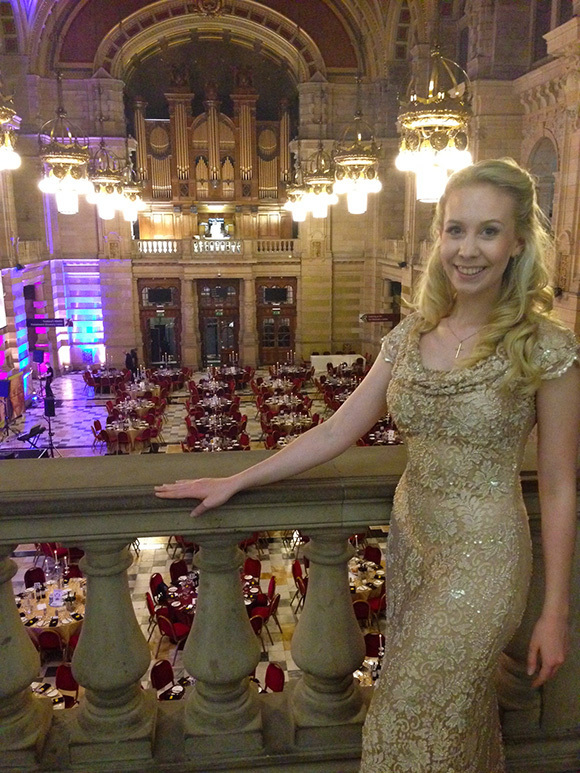 So I was thrilled to be asked to sing again at one of their fundraising events at the Kelvingrove Museum and Art Gallery. When I saw the venue I was amazed at the beauty of the room and I could sense the history of the building. The floating heads in the foyer were definitely a talking point. The view of the room from the balcony was amazing. George Todica when we first arrived at the venue. George Todica skilfully accompanied me on piano for the performance, it was tremendous fun and we enjoyed every minute of it. I met some lovely people and enjoyed talking with them throughout the evening. Lorna and Gordon, the organisers of the event. Two of the quiz-masters for the evening were Sean Biggerstaff ( who played Oliver Wood in the Harry Potter movies ) and Cat Cubie a prestenter from BBC Scotland. Really nice of you to help this organization. Well done. Hi John, I’m just very grateful to the organisers for an opportunity to do what I love. The real helpers are the 9000 volunteers who regularly help out in the shops, raise money and help out in the hospices. It looks as if it was a marvelous and very valuable event. I’m sure your performance was one of the real highlights of the evening. Thanks Mary I read on the Marie Curie Twitter that they raised £70,000 from the very generous businesses that participated this year so that’s just fantastic. Oh that is impressive! Great work on all your parts. The aim is beautiful, beautiful place, and you are radiating light! Thank you for sharing Mademoiselle Charlotte !! It was my first visit to the Kelvingrove Art Gallery and Museum which I’m amazed at, it houses a fabulous art collection. My parents have said the next time they come up we’ll go for a proper visit. 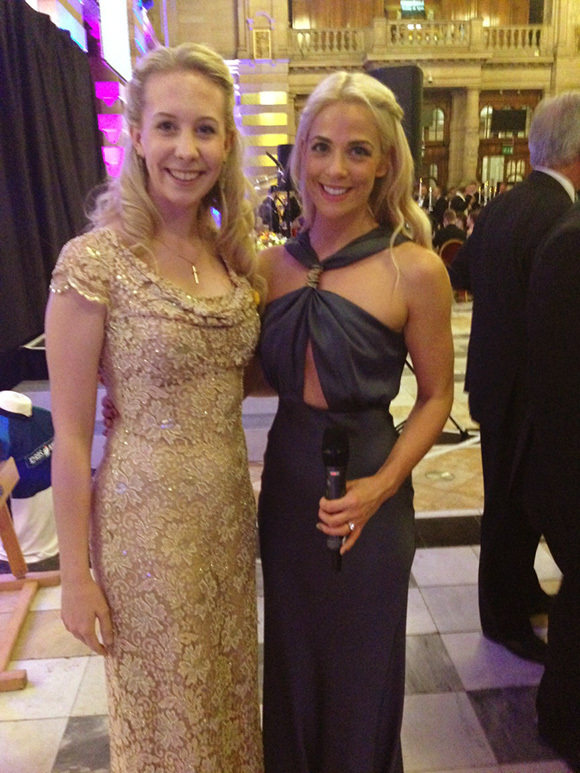 Wonderful event and you had a picture with the star to too. That is awesome! I had a lovely night, Sean was born in Glasgow, he was in three of the Harry Potter films and was one of the quiz masters on the night. A wonderful setting for such a fine cause. Good for you for helping them. It is a wonderful setting I found out its one of the top three free to enter attractions in Scotland and one of the most visited museums in the UK I can see why. Thanks Janice, I love my gold dress, I was at the Conservatoire all day so it was a bit of a rush to get ready so thank you. Thank you for being so generous. You sing beautifully too. One of my lovely fellow vocalists at the RCS messaged me to say her father was in the audience and was enjoying my singing so that was just lovely of her. Looks like an amazing event for an important cause. I especially like the exterior architecture style. You are rocking the dress, Lady. 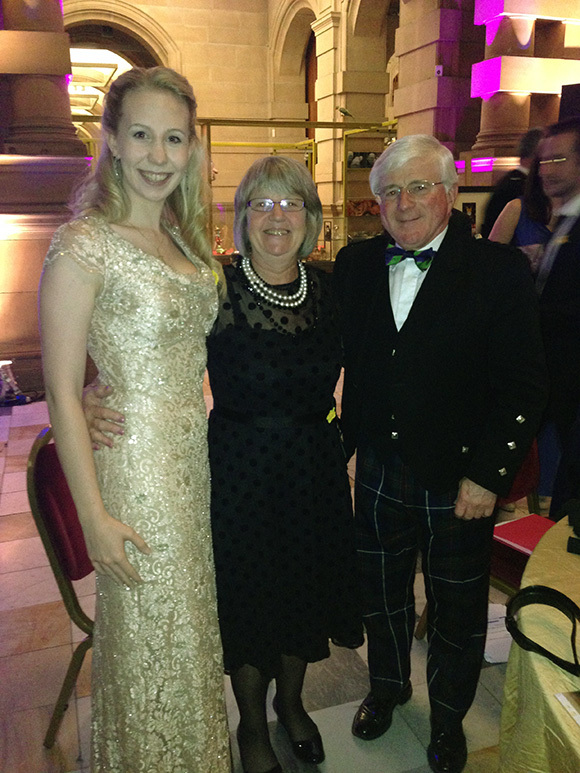 Great post – the dress is gorgeous (so is the lass inside it!). Thank you 🙂 I hope you’re well. The dress has little gold sequins on it fabulous. It must have been a great evening, and considerably enhanced by your performance. Good for you! Thanks Marcus I learn so much from each event I do. Everyone seemed to be thoroughly enjoying it. Congratulations, Charlotte! What an opportunity to sing for such a great cause, do you choose what to sing? The venue was so lovely; I could tell from your pictures, but the prettiest thing was your dress! I know what you mean–who needs an excuse to get dressed up? I wish we still had to dress up for dinner every day, and always make our own music singing together after dinner instead of just turning on the CD player. I love that you all sing together Cate, my brother Matt and I used to sing Disney and show songs together all the time, he has a great voice it’s a shame he stopped. The dress was a fabulous find this summer. Good luck to your family on this side of the pond. Goodness, Charlotte you look absolutely gorgeous and that dress is an absolute knockout. Congratulations! You are so talented. Cheers Beth, I love glamorous functions. I thought of you with the floating heads from your picture with the floating pink spiral wig, have you ever tried heads!? A beautiful dress, I agree. What a good cause too. My father wished to die at home when he had cancer four years ago and I do not know how we would have coped without the wonderful nurses form Marie Curie who cared for him overnight. It is so important that people can die at home if they wish Clare. I’m happy they were there for you and your family. Wow. Seems like an amazing experience and opportunity. Don’t suppose there is anywhere to see/hear the performance. You look stunning. I am very keen on Marie Curie as a scientist (I played her in a French play at school) and as the name behind a great charity. Fabulous women in history are truly inspirational, I loved biology particularly and chemistry at High School. I wish we’d have done fun plays and similar to learn more. Wonderful event. That’s quite a building. Great post and news dear Charlotte ! Your decision to participate is really touching ! You enjoyed the event,you met nice and famous people there and you did something you love doing ! Gorgeous your photos and the mansion of the Museum and Art Gallery.I visited it a couple of years ago and I have some lovely photos from there.